This is an abstract representation of the letter ""Q"" turned upside-down. The work is solid with an intense pink paint (Pepto-Bismal) color, and the shape is cuvacious and sensual. 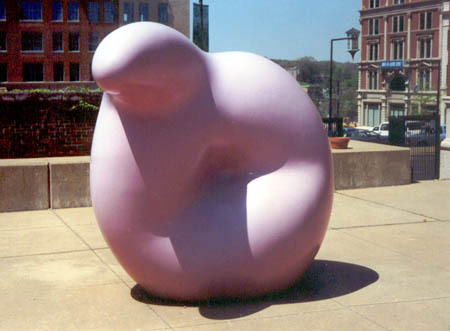 : Claes Oldenburg, “Soft Inverted Q,” Ohio Outdoor Sculpture Inventory, accessed April 22, 2019, http://oosi.sculpturecenter.org/items/show/884.